Leprechaun Pot of Gold Abundance Candle $16.00US Awaken the potential for abundance in your life. Face it folks we can all use a little more of something in our lives. "Reap and Sew"... Try this cute candle that is featured in the upcoming Leprechaun's Pot of Gold book by author Kristin Olsen. Light the candle, say or chant the saying on the candle and allow blessings into your life. Remember it is all about allowing and being open to the good things and keeping a positive attitude and of course giving and helping others. Candle is in glass. Made here at the Celtic Attic. 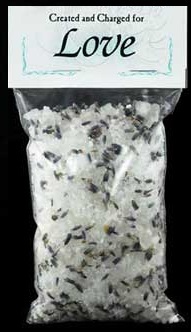 Bath Salts $4.25US Charged with energy, our bath salts are a blend of especially chosen salts and herbs infused with aromatic scents to bring the warm energies baths.